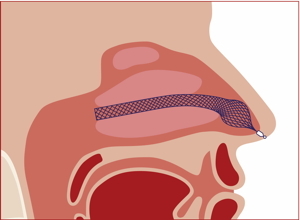 The AlaxoLito Nasal Stent is a medical device for treatment of decreased nasal breathing as well as resulting snoring. Causes can be nasal alar collapse, nasal valve collapse or turbinate hyperplasia. There are two different product variants which splint either the anterior nasal cavity only [AlaxoLito Nasal Stent] or the full length nasal passage [AlaxoLito Plus Nasal Stent] (see Figs. 1a+b). The product was developed together with the ENT physician Dr. Peter Renner (Cologne, Germany) and is specifically adapted for application in the nasal cavity. The smooth stent braid is made from the memory metal nitinol. It has a ball-shaped widening which is positioned at the nasal valve and a cylindrical longer section which splints the turbinates. The AlaxoLito (top in photo) and the AlaxoLito Plus, resp. (bottom in photo, see Fig. 2), is self-applied to the nose by the patient, usually for the period of sleep or e.g. during sports activities. The stent has an opening force adapted to supporting the nasal alar and nasal valve and to splinting of the turbinates. Thereby a healthy diameter of the airway and a very good therapeutic effect are achieved concurrent with high wearing comfort. The nasal tissue is not overstretched and no mucosal irritation occurs. 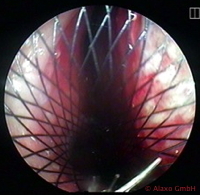 The innovative concept of the AlaxoLito Nasal Stent for the first time enables an efficient conservative therapy of turbinate hyperplasia and also nasal alar collapse. As a result wellness and health of a large number of patients can be improved. For application the AlaxoLito Nasal Stent is pulled into a thin introduction tube (see Fig. 2) which then is introduced horizontally into the nose (in the middle or inferior nasal passage). Subsequent retraction of the introduction tube from the nose leads to self-expansion of the nitinol braid. The ball-shaped widening locates directly at the nasal valve (see arrow in right photo in Fig. 3). The cylindrical section splints the anterior (AlaxoLito) or the full (AlaxoLito Pus), resp., nasal passage. Usually each one stent is introduced into the right and the left nostril. 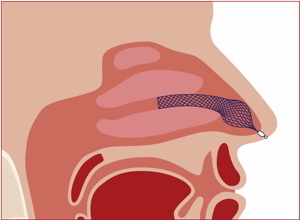 Simple handling of the AlaxoLito Nasal Stent allows easy self-application by the patient. The nasal stent is optimized in its design so that it is hardly visible in the nostril. Due to the shape of the nitinol braid stable positioning within the nose, secured against shifting during application and sleep, is achieved. The nasal valve and the nasal alar are efficiently splinted (Fig. 3) but without any expansion by strong pressure. Therefore no uncomfortable feeling of pressure arises. 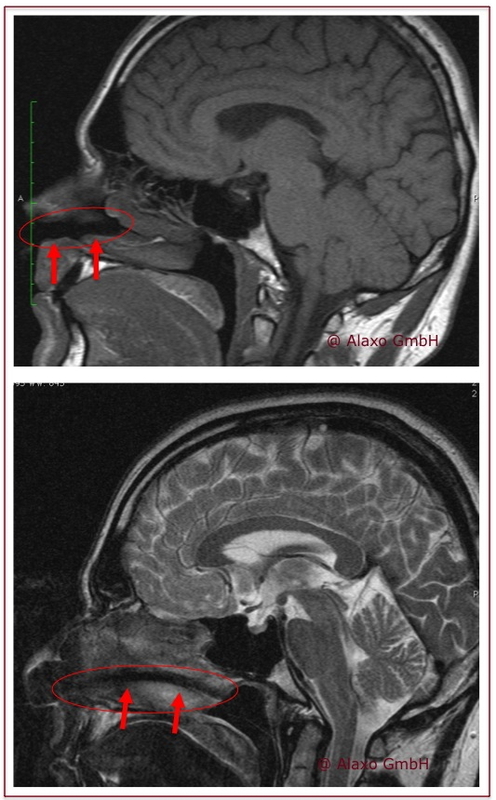 The AlaxoLito nitinol braid is well visible in magnetic resonance imaging (MRI) in the nasal cavity and the nasal passage (Fig. 5). Also in computer tomography (CT) the position of the nitinol braid in the nose, especially of the ball-shaped section directly at the nasal valve, is clearly visible (see arrow in Fig. 6). Dr. Peter Renner tested the AlaxoLito Nasal Stent by rhinomanometry for its efficacy in increasing nasal flow with 10 patients with decreased nasal breathing (Fig. 7). 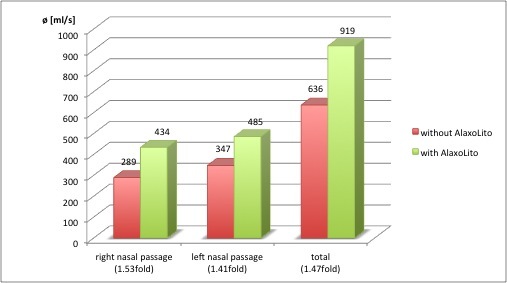 On average the nasal flow of 245 ml/s was improved by 123% and a value of 546 ml/s – which is normal condition – was achieved. The maximal value recorded for a single nasal passage was plus 724%. 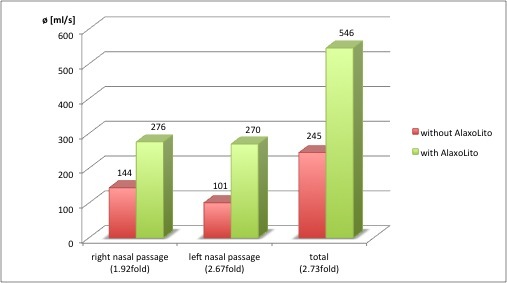 These results demonstrate the power of the AlaxoLito Nasal Stent to increase the nasal flow of patients from a severely reduced level to a normal level so that healthy nasal breathing is enabled. Another test with 11 healthy persons proved increase even of normal nasal flow by 47% on average by use of the AlaxoLito Nasal Stent (Fig. 8). Application of the AlaxoLito Nasal Stent leads to a significant improvement of nasal breathing and reduction of flow noise. Sleeping becomes more healthy and relaxing as a consequence of the improved oxygen supply. Testing of the AlaxoLito during sports (road racing, cross country skiing, mountain hiking) resulted in a strongly enhanced condition. Its application during endurance sports may lead to severely enhanced performance of the sportsperson due to the improved nasal breathing. 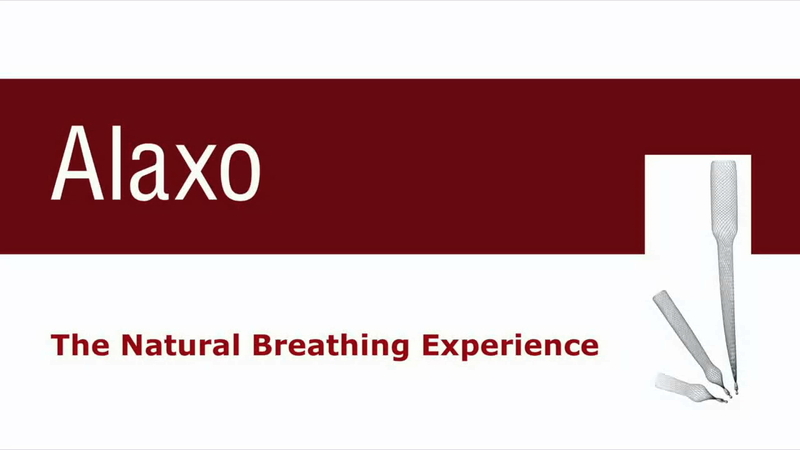 It is known that nasal breathing compared to mouth breathing increases the blood oxygen content by 10-15% and that it stimulates the parasympathetic nerve system. Likewise, first application tests in case of a swollen nose demonstrated that with AlaxoLito nasal breathing can be well restored, allowing for a calm sleep of the user. The AlaxoLito Nasal Stent information flyer can be downloaded here. 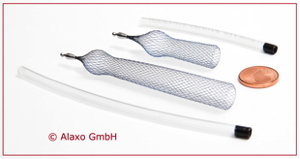 The AlaxoLito Nasal Stent Instructions for Use can be downloaded here.